In the North, life is harder than south of the Nieder Straits. In the fjordlands, running out of firewood doesn’t mean a chill night, but exposure to bone‑wracking cold or a trip into the dark and dangerous forest for kindling. Everyone from king to lowly thrall must work hard daily to survive. A life of indolence is unheard of—and impossible without help from powerful magic. Work-shy characters aren’t just lazy; they’re ostracized as threats to the community. People of the North are practical and independent, energetic, and inured without complaint to the hardships of life. No central authority demands taxes or a cut of a party’s loot, but at the same time no one reins in the excesses of monsters and unscrupulous rulers. When bandits or trolls or a jarl’s bullying huskarls come prowling, it’s down to each family and their friends to choose fight or flight. Death comes to all sooner or later, for no matter how well prepared and defended, nothing lives one moment longer than it’s fated. Nature is more dangerous than the most savage band of raiders. Deadly creatures lurk in dark pine forests, blizzards and snowdrifts can isolate farms and towns for months at a time, and the temperature plummets to a deadly chill during the winter months. Even daylight, the oldest defense against ghosts and skulking horrors, dims as the year ends and dooms people to huddle around their fires and stare nervously into the dark. For all its harshness and hazards, however, the North is indisputably, breathtakingly beautiful. Frost glitters in the morning sun, making the world shine as if coated with diamonds. Waterfalls thunder over cliffs, cascading down through an unearthly haze of mist and rainbows. The land’s beauty inspires countless poems and songs, but for those lost and starving in the wilderness, the allure can be deadly, dulling the mind to approaching danger. Outside of family and clan, felag is the strongest bond in society. It means “fellowship” and “partnership” and is linked to the power of the Fe rune, which represents division of wealth. A felag oath-taker swears to loyally support one’s chieftain and fellow warriors in a sacred bond between companions. This oath defines the felag’s aims, its right to depose and elect leaders, and fair division of the spoils. Most Northlanders are karls, free farmers and artisans—and part time raiders and traders—who answer only to themselves. Unlike their counterparts in the feudal hierarchies of the south, homesteaders aren’t bound to a local lord by anything but their own choices and oaths. 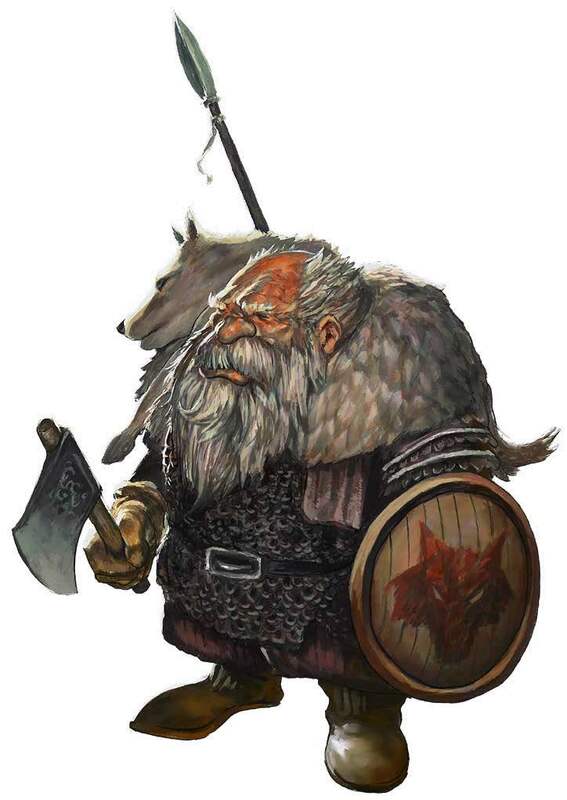 Karls who directly serve a lord are known as huskarls (“karls of the house”) and make up a lord’s chief allies, administrators, and personal bodyguard. A wise lord is free with gifts and opportunities for glory, else a few karls may look elsewhere for a patron. The blandishments of Loki, Boreas, giants, or the trollkin sometimes win over a karl far out on the cold margins of civilization. Above karls are chieftains, jarls, and kings—nobles defined not by bloodline or divine provenance but followers, ships, and estates. Sometimes the North has many kings and sometimes it has none, but rarely do they unify more than a relatively small area, and never for more than a generation or two. Royalty attracts more than enough rivals, invaders, and pretenders to stymie any ruler’s power, and successions are always disputed. Kingship is not regarded as especially sacred or special. Some rulers might claim descent from a hero or god (occasionally backed up by genuine divine favor), but success is the only real measure of nobility in the North. In the lowest social class are the thralls or slaves, prisoners of war or unfortunates kidnapped by raiders or bound servants unable to pay their debts. Most thralls lead hard lives, but some rise from such depths. Everyone respects triumph over adversity, and good slaves are considered part of the family, sharing its hardships and successes with everyone else. Karls often free their slaves, either in their wills or by treating them as freed villagers as the years go on. Social order is fluid and defined by one’s actions: Kingship and jarldom are forged through war and adventure, not guaranteed by bloodline. The unyielding landscape hammered Northern life into its current shape. The surroundings define its people far more than race—the societies of humans, dwarves, giants, and others share much in common. They approach life with the same bullish mindset, worship in a similar fashion, and follow roughly the same customs. Humans can travel to a trollkin steading or a goblin hall with reasonable expectations of proper etiquette. Still, each species exhibits prejudices and preferences, muddying the waters of tradition and adding unexpected twists that can form the basis of adventures. Jotuns rarely think it unfair to challenge guests to giant-sized games of strength for example, while kobold Tings (see below) are notorious for backstabbing politics, and what’s on the table at a troll feast might not be palatable to other races… although it’s still rude not to eat. The most common shared customs involve honor and reputation, hospitality and feasting, the Ting, wergild and duels, and the infamous reaver raid. Once Northlanders sail south, however, these customs might be left in their wake as circumstance, company, and convenience dictate. Certainly those on the receiving end of a raid have no recourse to any protections offered by Northlands mores. This is not to say that those from the Northlands simply run wild when far from home. When engaged in trade, the Northlanders’ familiarity with foreign customs often catches southerners off guard, surprised by just how cosmopolitan these warlike people turn out to be. Reputation is everything. Warriors tell tales of old comrades and adventures, and skalds sing of deeds both valorous and vile. Passing news and gossip is a common pastime from thralls to kings. Desire for a good reputation compels men and women to acts of generosity, valor, and hospitality, while ill-repute is rightly feared and the taint of dishonor difficult to shed. Northlanders have a prickly sense of honor: A good name is all that remains after death, so most people don’t just want to do the right thing, they want to be seen doing it. Honor isn’t the same as goodness, however. Wicked reavers are considered honorable, and some good Northlanders are known as nidingr (honorless) for abandoning the crueler Northern customs. Regardless of alignment, an honorable man or woman is generous in gifting and hospitality, fair-minded in judgments, and fearless in battle. The ability to uphold such values can keep even the truly malevolent in good favor with the gods, and the ability to subvert such customs to meet one’s goals draws the favor of the more devious among the deities.